I really expected this one to sweep me off of my feet. I may not be one for books centered around a romance, but, considering that I had loved Twilight in it's heyday, I thought I would enjoy this one. I met Elizabeth Richards on the Breathless Reads tour and I really liked her and I got super excited for her book. It sounded like something I would enjoy--gritty, dark, and full of action. It sounded exciting and fun! It's not say that I didn't enjoy this book at all, but I didn't like it as much as I would have hoped. First of all, the whole sense of insta-love really got on my nerves. Now, I know that the whole reason that there is even a book is because of their relationship, but I really hate insta-love. It wasn't just a teenage infatuation; it was this full-blown love that they had that bothered me. I didn't buy into their connection, Ash's and Natalie's, and I think this is what significantly brought down the value of the book for me. There's the whole meaning behind why they're so in love, but I don't think that it was properly executed for me to enjoy it. I've read books where the insta-love didn't feel like insta-love because the characters got to know each other more than just the stage of wanting to jump each others' bones. On top of this, I couldn't connect with any of the characters. They all seemed so dull and naive and I quickly became bored with the book. I finished it, because I knew that it was worth finishing and that there was at least some inkling of interest in me that kept me going--but, man, was it hard. I will read the next book, definitely, but I'm in no rush to get there. This book has a lot of potential. I see it. I want it. I'm hoping that with the second book that there will be an improvement in character development and more plot twisty kind of stuff. I don't know. I want to like and enjoy this series. I really do. There was plenty of action--and a little bit of plot-twisting that went on. The world building was pretty awesome to picture. It was very different from what I have ever read in a dystopian. Like I said, this idea for the book is very interesting, but I can't help but feel that there is something missing from it all. Black City was definitely something I haven't read before. It was gritty and bloody. Fans of Twilight will definitely enjoy the relationship Ash and Natalie share. While the book did not reach my expectations, there were a few elements that made the book enjoyable, like the plot twists and world building. I enjoyed the dual perspectives, like I always do when they're included in books, and I hope to see more of a complex storyline and dimensional relationship to spring up in the second installment. I think for the most part, I agree with you. I remember when I read it. It was around a time where I had just finished reading three 1-star books in a row. 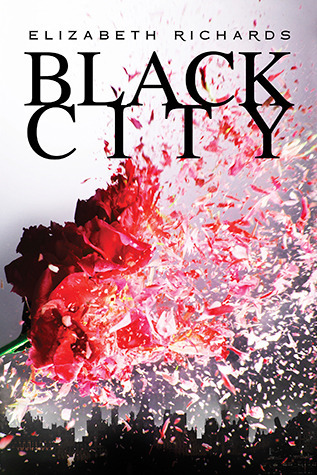 So, when I reviewed Black City, my rating was a lot higher than yours. 4 1/2 star, maybe? I hated the insta-love, too! I felt like the relationship that developed shouldn't have been possible. In my opinion, there were a lot of ... reasons that should have prevented them from "falling in love." I love dystopia, but I feel like it's a little played out nowadays.